Scott Page, saxophone and rhythm guitar player during Pink Floyd's "A Momentary Lapse of Reason" era has joined forces with Roger Waters veteran vocalist Robbie Wyckoff. The two are now part of an all-star band that will play Pink Floyd music. 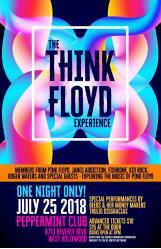 The band, Think Floyd Experience, will be streaming their first performance, taking place in West Hollywood, this evening (Wednesday, 25th July, 2018), on the Ignited Network. "Our intention is to extend the Pink Floyd legacy - but the idea is to bring a very high tech and experience-based element to it. Tech will be a big part of the experience. We're focusing a channel on the Ignited Network on the project and live streaming our first gig. The channel, Pink Floyd Exp, will eventually be on blockchain, etc. We plan to make Think Floyd Experience a virtual reality endeavour." What sets the project apart is the history and the prominence of the musicians involved. Page and Wyckoff are joined by Jane's Addiction's Stephen Perkins on drums, Fishbone's Norwood Fisher on bass, Kid Rock's Kenny Olson and Jon Stankorb (of Signs of Life, the American Pink Floyd – a tribute band of its own) on guitars, and Roberta Freeman, another Momentary Lapse of Reason tour alumnus, on background and lead vocals. Page and Wyckoff met through Olson who had played with the two in separate projects. Page, in turn, met Olson through Fisher when they played a NAMM show related gig at the House of Blues in Anaheim (the Nights After NAMM All-Star Mash-Up) earlier this year. But it was a gig with Fisher's band, Trulio Disgracias, which cemented things: Page and Perkins were guests with Trulio Disgracias at Los Angeles' famous The Mint club for a performance of "Wish You Were Here." During that performance the musicians got a vibe that they had a good thing going. Page had worked with Perkins in the past: he played on Jane's Addiction's 2003 album "Strays." The concert begins at 8:30pm Pacific Standard Time (11:30pm Eastern Standard Time and 4:30am British Summer Time). 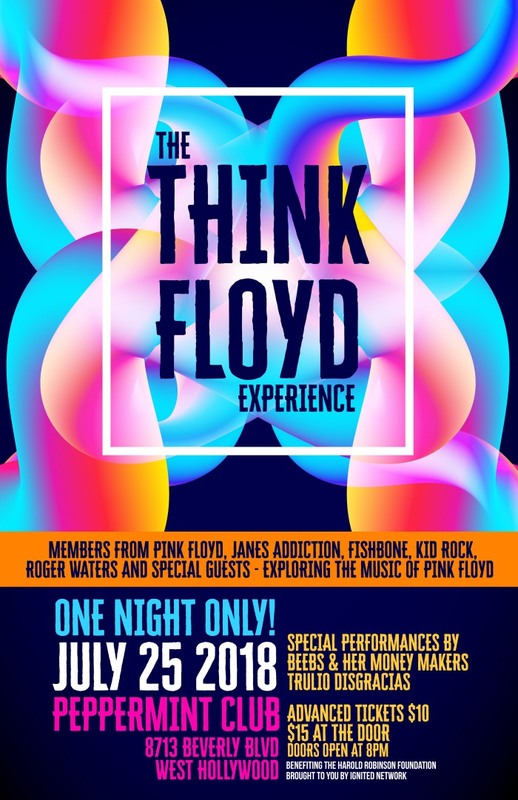 Think Floyd Experience will perform at 9:15pm (Pacific Standard Time, or 12:30am Eastern Standard Time and 5:30am British Summer Time). For those who are familiar with 80s movies, actor and musician Corey Feldman will be making a guest appearance. In order to view the show live or otherwise (and access some of an obscure catalogue of behind-the-scenes videos and collectibles from Page's time with Pink Floyd) if you are unable to attend in person, you need to register on the Ignited Network at this link: Ignited Network Scott Page Invitation. This is for iOS devices, so iPhones, iPads and iPod Touch devices. Proceeds from this event will go to the Harold Robinson Foundation.